Why Should I Use A Cooling Pad? How Do I Care For My Pad? Waking up sweaty is the worst. Sleeping hot makes you toss and turn, interrupting your sleep and causing injuries and sore places where you’ve wrenched a muscle trying to find a cool spot. Your partner is probably sick of you moving in on their spot, but you’re just trying to find a cool place. Forget about cuddling. Body heat only makes it worse. You need a cooling mattress pad to help wick away heat and moisture more efficiently. When your core temperature is cooler, you sleep more restfully without all the tossing to wake you up. Interrupted sleep filters into everything you do, so let’s get you cooled down and sleeping again with our best cooling mattress pad review. Many temperature issues are matters of air flow. If you sleep on an old-style memory foam mattress, you’re probably familiar with what’s going on. Heat stays trapped in the fibers and gradually builds in the core of the bed only to reflect back onto your body. It doesn’t matter how cold your room is, you probably still feel warm on these types of mattresses. Cooling pads have a few different tricks to help alleviate the heat. First, some are open cell or high loft materials that allow better airflow. The cells fill up with air, and as you move around, that air is forced from one cell to another, creating a continuous air flow that pushes heat through the mattress and out where it can dissipate. Another method is using a cooling material injected into the pad itself. Gels are good examples of this. Tiny gel beads or a gel infusion pulls heat away from your body to the cooler part of the gel. Heat moves through the beads as they try to equalize temperature and gradually dissipates, reducing the amount of overall heat stored inside the mattress itself. Air conditioning systems can only do so much before they begin to interfere with your health. Air conditioners can be drying to the air as it recycles air from inside your house. Dry air is hard on the lungs and nasal passages and can cause long term allergic reactions when used too much. Air conditioners and fans only work on the surface. You don’t address the root of the problem, which is heat getting trapped under your blanket and radiating out from the mattress itself. Until you handle that temperature issue, you’re going to be hot no matter what you do. Cooling pads can also help create a better contouring for the surface of your mattress. If your bed is older, they can revitalize the surface, giving you better comfort and a cooler night’s sleep. Solving these issues could help keep your sleep healthy and consistent. Not all cooling pads are created the same. You should consider a few different things before deciding on your cooling pad so that you get precisely the right one. The first decision you make concerns how hot you get. If you only get a little bit hot during the night or you sleep with a partner that doesn’t have temperature issues, you may only need a simple mattress pad with a high loft for better airflow. These open cell fibers naturally cool you down just a bit without creating an uncomfortable environment for your partner. If you get really hot and sweaty, a pad with gel can really help lower your temperature and keep it comfortable. Other infusions could include charcoal or green tea to help combat moisture and odors from your sweat to keep the surface of the mattress pad fresher. Graphite is also an excellent way to stay cool with a more natural substance than gel infusions. Other options include more exotic materials such as copper to help keep you cool. Copper conducts heat really well so heat will continue to flow away from you through the night. It’s also naturally antibacterial and could have healing properties, particularly recovery from muscle strain. If you can find a cooling pad with a sufficient trial period, you can get a feel for how effective the pad really is. Sleeping on it for a week or a few weeks can give you a better idea of how your sleep improves, and if it doesn’t improve, what the issue may be. This trial could lead you to the mattress pad you really want through experimentation. If you can’t get a lengthy trial period, make sure that you can return the pad within a reasonable amount of time so that you aren’t stuck with a pad that doesn’t work for you. Not all cooling pads are right for everyone, so it’s critical that you have at least a little bit of time to make a decision even if you can’t conduct a full-length sleep trial. Investing in your sleep is a long-term solution. You may be tempted to low ball your budget here, but if you can manage, a higher priced item is often better made. While we do understand balancing a budget with getting what you want, this is one of those times where a cheap knock-off could cost you money in replacing it in the long run. Products don’t have to be prohibitively expensive but investing in a little bit more often gets you a product that’s better made with better quality control. Higher priced pads frequently come with trial periods and longer guarantees os that you can be sure the product is the right fit for you. While there are options out there if your budget is completely fixed, spending money on your health and well-being is always a positive experience. Most pads of this type aren’t machine washable, but many of them can be spot cleaned with mild soap and cloth. Make sure you use something mild to clean any spots, so you don’t damage the surface of your pad. If you’re able to machine wash your pad, that’s always a huge plus. Wash it on the gentle cycle, and either air dry it in your dryer or hang it out somewhere. High heat will damage the integrity of the materials and could shred the pad completely. Make sure you sleep with a sheet on top of the pad, so your body isn’t in direct contact with it. A sheet will reduce the amount of oils and skin cells that make their way to the surface of the pad, causing potential allergy issues and just degrading the surface over time. Avoid eating and drinking in bed (we know) to avoid potential spills. Our top picks for best cooling pad should help you get your sleep back on track by lowering your temperature and helping control moisture. Let’s take a look. Our first mattress pad is air engineered to help contour to the body more efficiently and provide air flow that keeps you markedly cooler throughout the night. It was designed by sleep experts and engineers to give you the most cutting-edge mattress pad you can get without all those nasty chemicals. The cover is a unique microclimate design that adjusts with your body temperature throughout the night. It responds as you cool down or heat up creating less interference with your deepest rest. It adjusts evaporation when you’re most likely to sweat and offers cooling that changes as your body temperature changes. Underneath, open cell foam with gel micro-beads maintains air flow even when compressed. The deep channels help further regulate heat while zoned areas give you more support where you need it and give way underneath pressure points to relieve pain. It’s CertiPur-US certified and uses a process that uses up to 97% fewer carbon emissions. It’s not waterproof or machine washable, but it does come with a 30-day trial and a five-year limited warranty. Plus, it ships free and qualified customers may be eligible for financing. Our second choice is Nest Bedding’s cooling pad. It provides two inches of cooling memory foam to help alter the feel of the surface of your mattress. Its three-pound memory foam is infused with gel to help conduct heat away from your body efficiently and reduce temperatures at the core of the whole mattress. It provides complete airflow through open cell materials, and the cover is the same cooling cover used on their mattresses. The phase change material adjusts to your temperature quickly throughout the night, moving heat away and wicking moisture to help keep you more comfortable. It’s made in the US, and CertiPur-US certified, so there are no harsh chemical smells. It isn’t waterproof and can’t be machine washed but it does ship free, and you may qualify for financing. It comes with a 100-night trial, but be aware that Nest requires you sleep on the pad for at least 30 nights before you’re eligible for a return. That gives you time to adjust to the pad fully but may be irritating if you find that you just don’t like it at all. Lucid is an excellent alternative if you’re on a tighter budget. For less than $75, you get a gel infused memory foam pad with zoned support and plenty of temperature control. If you need a quick alternative to alter your mattress surface, this could be the one. It uses two inches of memory foam with zoned support. You get denser support underneath areas that need more firm responses, but areas where you experience compression and pressure give way more easily. It targets pain and discomfort throughout the night. The gel infusion quickly moves heat away from your body and prevents it from building up in the core of the mattress. It’s very breathable and handles sweat pretty well. It can’t be machine washed and it isn’t waterproof, but it does ship for free. Contact your individual seller for warranty information and return policy. It’s a bit more delicate because there’s no cover on the pad itself, so be sure you’re sleeping with a sheet on top. You may also want to use a thin mattress protector to keep the foam from ripping if you’re a restless sleeper or if you have pets in the bed with you. For those of you wanting a more natural option, copper is also an excellent conductor of heat. The Layla pad is infused with copper beads that move heat away from your body quickly, conducting it out of bed instead of storing up in the core of your mattress or next to your body. It compresses well under pressure points, helping to relieve pressure without losing the support you need to keep your spine straight. The material is open cell to help air flow freely through the pad, wicking away sweat and moisture for a better sleep surface. Copper is naturally antibacterial, so the pad will resist odors, molds, and mildews as well as stave off common allergens associated with bedding. It actively blocks and kills those bacteria that can keep you sick. It’s not machine washable, but this does offer an extra layer of protection. You can spot clean it carefully but use a mild soap only. 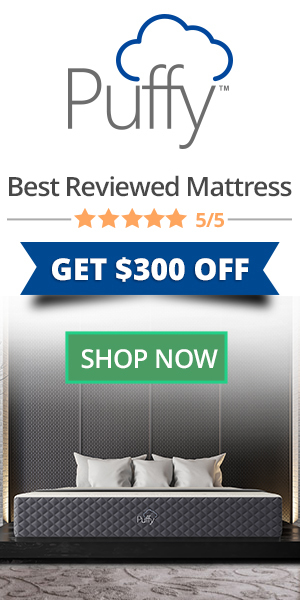 It comes with a 120-night sleep trial and a five-year warranty against mattress defects. There’s no minimum trial period before initiating a return, but try to give it a few weeks so that you know if your sleep has improved sufficiently. It comes with free shipping, and qualified buyers may be able to finance it. Saatva uses a graphite infusion to help keep the surface of the pad cooler and wick away moisture more effectively. Graphite helps cut down on odors and is a more natural substance than just gel. Saatva’s pad uses memory foam to help contour to your curves, providing support where you need it and keeping your spine straight. There’s a transitional layer that helps ease your body to the surface of your mattress. This one is good for those who want to alter a too firm mattress, or whose mattress has aged and needs to be revitalized before being replaced. It also helps reduce motion transfer so if you or your partner is restless, you both will have a more peaceful sleep. The organic cotton cover is cool and soft, providing a bit of protection for the foam layers underneath. There are straps to hold it in place. It’s not waterproof or machine washable, but the graphite is naturally antibacterial, and the surface can be spot cleaned with a mild soap. It comes with a 120-night sleep trial and free shipping. You can test out the pad to see if it’s genuinely helping you sleep better and if it isn’t, initiate a return before the trial period is up for a refund. Qualified buyers may also be eligible for financing if that smooths the buying process out. A cooling pad helps keep your temperature regulated so you can sleep better. When you’re up all night, tossing and turning, looking for a cool spot, it’s going to affect every aspect of your life. Your AC and your fan aren’t going to handle the temperature at the core of your mattress, so a cooling pad can make a huge difference in the long run. It can also help keep your mattress more sanitary if it helps reduce the amount your sweating. Natural infusions help with odors, and antibacterial pads also prevent common allergens from wreaking havoc with your health. Overall, they’re a good investment for a tired mattress or for a bed that you love but doesn’t help with your temperature. Stop sweating. Stop cursing in the middle of the night. Stop avoiding your partner’s cuddles. Get a mattress pad that can help regulate your temperature and get your sleep back under control. Once you find the right one, you’ll wonder how you ever lived without it. We promise.